Craftsy is having a Valentine’s Day Sale! 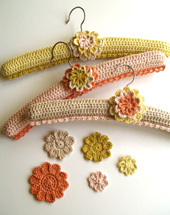 Not only can you get my crochet classes (check out all the cute projects! ), you can also check out all of the awesomeness we’ve been working hard to produce. I’ve met so many awesome instructors and I think you’ll not only learn, but enjoy watching these classes and interacting with these wonderful ladies. Enjoy! 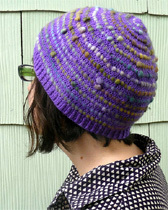 When I first started going to my local yarn shop (in Montana) one of the yarns I was immediately drawn to was Noro. The colors are simply amazing, and as a designer, I’ve always loved it for it’s LONG repeat. Variegated yarns often alternate colors too quickly for crochet, and so do many “self striping” yarns designed for knitting. 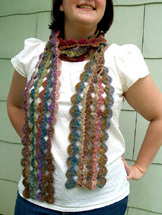 But that’s not the case with Noro and that’s why I’ve always loved using it in my designs. 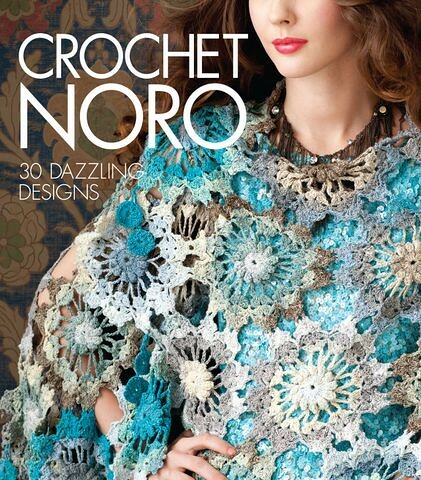 When I found out that Sixth & Spring was publishing a Crochet Noro (to follow up to their Knit Noro books) I was excited! My two contributions are both really simple to make, and ideas I’ve made or bopped around in my head for a long time. 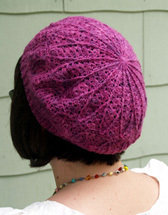 The beauty of this yarn is that it does not need a complex pattern. I repeat: you can do some fancy footwork, but there’s no point, because everyone’s going to be staring at the color. And don’t we all know how nice it is to have a pattern that doesn’t make us think? I am enjoying that more and more these days. 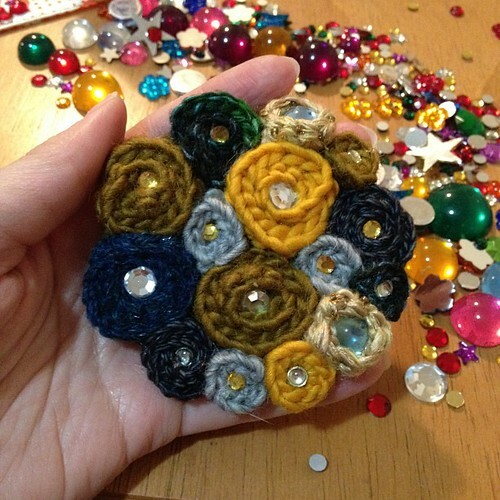 This Floral Necklace was born out of the nametag holder I made for my name badge when I worked at Yarnivore. I whipped it up one day while it was relatively quiet and continuously got asked how to make it, so I figured this would be a nice + easy design to submit- and it was. We added beads to the centers and used Taiyo sock to make it delicate–but I still think you could work it in a heavier yarn if you wanted fewer strands. There are tons of other lovely designs, including a couple totally wearable basic cardigans worked in the round and fun tunics and shells–plus, lots of quick accessories, all lushly photographed as is the Sixth & Spring way. 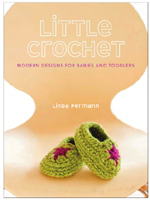 Pick up a copy and get inspired the next time you’re at your LYS, or right here. 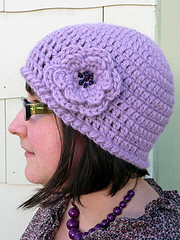 Photography by Rose Callahan copyright © by Sixth&Spring Books/Knitting Fever, Inc. All rights reserved. Used by permission. Disclaimer: All book links are affiliate Amazon. links. Sorry to have pretty much fallen off of blogland lately, we’ve been busy planning for the wedding and for going home for the holidays (YAY!). In the meantime, lots of projects have been published, so here I am to share. 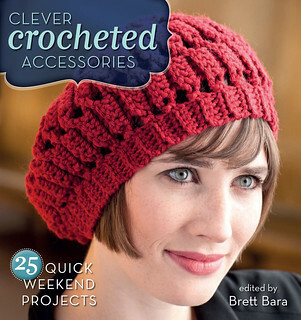 Brett Bara put together a fun compilation of accessory projects for her latest book with Interweave, Clever Crocheted Accessories: 25 Quick Weekend Projects . She asked me to do some fingerless gloves, and I knew I wanted to work in Madelinetosh, because, well, it’s Madelinetosh. I love, love, love cables and sock yarn and combined them to make these Cabled Mitts (ravelry page here). I remember I was working on these while waiting for my sister at the local college and an avid crocheter came up to me and remarked that she didn’t even know you could do that in crochet. You can! These are simple to make, because there’s no shaping, so you’re pretty much making an intricate rectangle that’s reversible from hand to hand. I made a second pair of these for myself, but I did a ribbed cuff instead of carrying the cable all the way up, and that’s pretty easy to do, too. I find cables to be so addictive, I guess I like changing things up every few stitches. 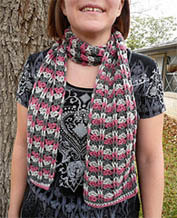 The second scarf is an example of what a simple stitch and a luscious yarn can do. 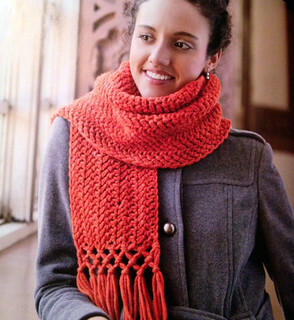 The Knotty Herringbone Scarf (Ravelry link) is made from Malabrigo Twist, a super soft and squishy merino wool. I’ve been wearing this one around Colorado–because we live her now and I can wear warm scarves!– and I get so many compliments, probably because of the fun color. The knotwork adds another interesting detail, and it’s not very hard to do. If you are feeling fancy you can throw some beads in the fringe for extra fun. 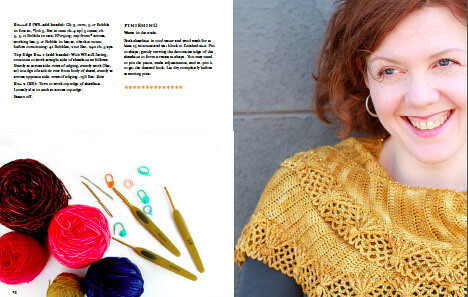 The book is full of beautiful and quick designs to make by designers you love, like Robyn Chachula, Ellen Gormley, Marly Bird and more –and you can even download it for instant gratification or quick-start gift making. Be sure to check it out! 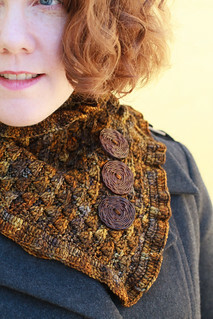 In the spirit of avoiding shopping malls, all of my individual patterns are on sale for 20% off from now until Monday 11/26 with the coupon code turkeyday. In case you missed it, I released individual patterns from my E-book last week as well, and those are included in the sale as well. This applies only to the patterns in my Ravelry store, so if you are in need of some patterns to make holiday gifts, go check it out! 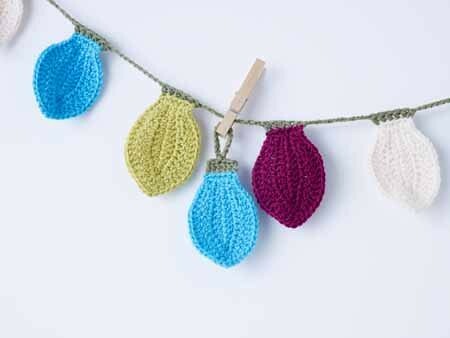 Craftsy is also having a huge sale on ALL classes- each is $19.99 or LESS! If you haven’t tried one yet, now is your perfect chance! I have had the pleasure of producing a lot of classes in the past few months and I have to tell you, the instructors are so talented and giving with their years of knowledge and expertise. I always learn new things, no matter what the subject. And remember, you can take them whenever you want to, so even if you’re busy with holiday hustle+bustle, you can save one up for the new year. Just a few little updates on my recently released E-book venture, Sugar and Spice: Six Bakery Inspired Crochet Designs. First off, you can listen to me talk about why e-books and my inspiration for these particular projects (plus get a chance to win one!) 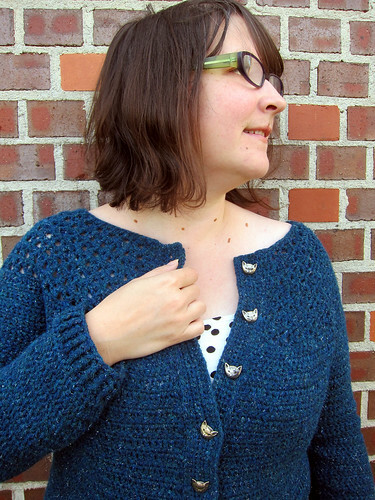 in the Yarn Thing podcast with Marly Bird. 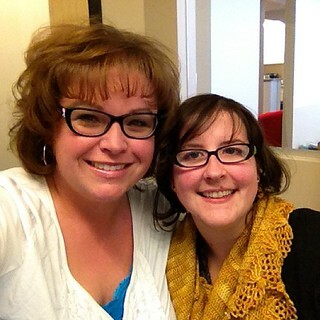 We podcasted live from the Craftsy offices, which was a pretty fun way to do it! I’m wearing my Sugar Sparkles Shawlette–which, if you couldn’t tell–is laden with beads, check it out! 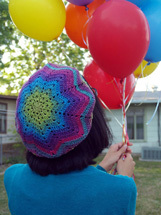 Here’s the announcement from the Malabrigo Blog (the book is part of their Freelance Pattern Project). 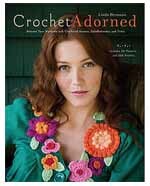 Susan B. Anderson had some lovely things to say about it, including: Honestly, I don’t think I’ve ever seen more gorgeous crochet designs in my life. Robyn Chachula reviewed it here (hurry for a chance to win a copy! ), saying: And this collection, is definitely a book. Everything is professionally edited, photographed, and laid out. 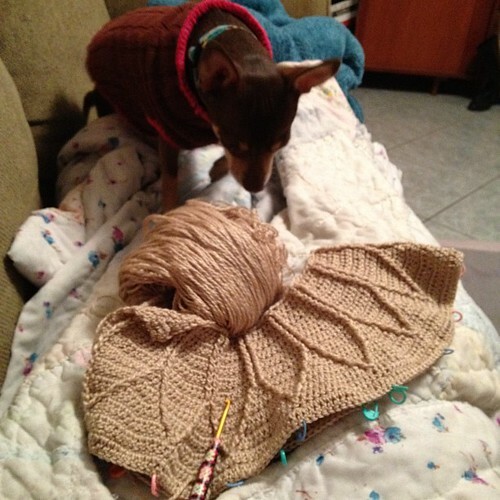 Anything you might need explained is described in detail as you would expect with Linda’s patterns. More to come, and thanks so much to everyone who has purchased it so far. I really appreciate it! Tomorrow: Another new design! Next week: More reveals. It seems like all of the work I finished just before I took this job is coming to the light now. I’ve been working on a secret project for the past year that I can finally share with you; it’s an e-book! Last year, when I had no idea where time would take me, I knew I wanted to work on a book-like project and I wanted to do it myself. 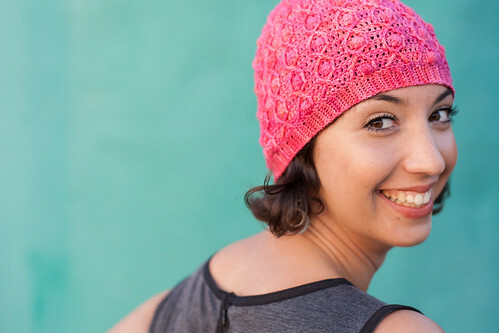 The Malabrigo Freelance Pattern Project was the perfect opportunity: malabrigo donates the yarn, the designer makes the e-book. It’s already a favorite yarn of mine–it’s soft, with wonderful colors, and a good value because of the generous yardage. I got the green light on the project and got to work. 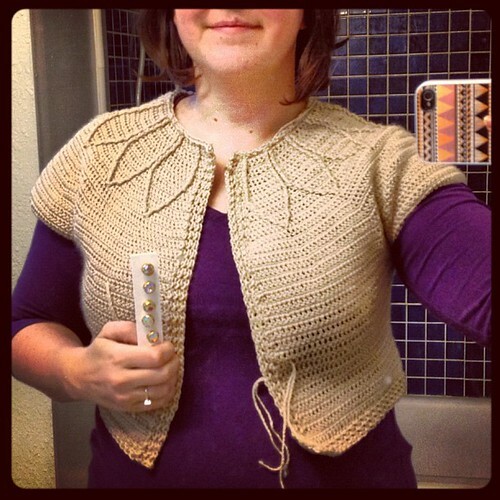 Luckily I finished all of the designing before I accepted my job at Craftsy, and was able to turn around the tech editing process (with KJ Hay) before I moved. I hired Caro Sheridan as my photographer–and she did a wonderful job showcasing the details in the fabric. Since I was making steady money and had a lot less time, I decided to hire a graphic designer (Heather Crank, who I work with at Craftsy) to put it all together. 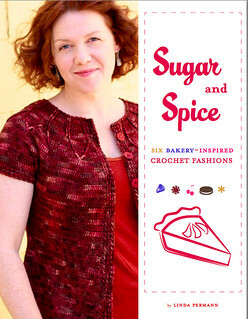 And now I present you with Sugar and Spice: Six Bakery-Inspired Crochet Fashions! 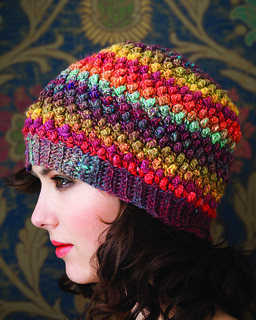 All of the projects are named after desserts, and most of them feature post stitches, bobbles, or other crochet texture. 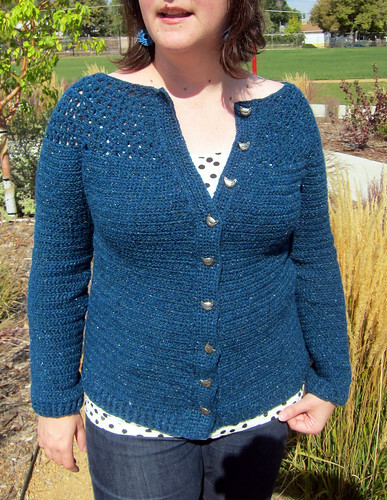 Piped Petals Cardigan is shown on the cover, it’s a top down cardigan that builds post-stitch petals into the yoke along with the increases. It’s actually quite simple to make but with stunning results. 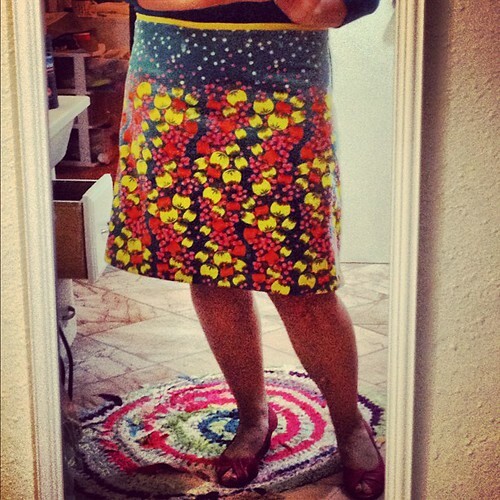 I made it to fit me and I wear it all the time: yay, bonus of doing an E-book! 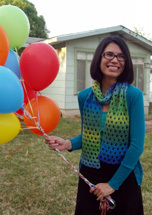 Tart Shrug is a motif-based shrug sized between 31.5 and 56.5″ at the bust (6 sizes) featuring Malabrigo Twist (bulky). The motifs are joined as-you-go and the ribbing is worked into the finished piece so there is very minimal seaming. All of the buttons used in the book were generously donated by JHB Buttons. I love buttons! 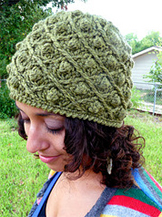 Pizzelle Beret is a richly textured hat worked in Malabrigo Lace (one of my absolute favorite yarns for crochet). Since it’s worked in the round from the top down, the right side is always facing you, and it’s somewhat intuitive where the post stitches go, once you get going. Check out the larger photo on my flickr page to really see the details. 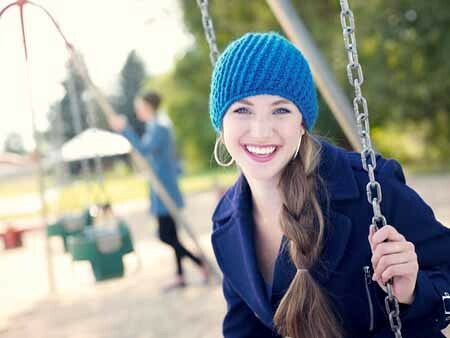 It creates a wonderfully light and soft fabric, perfect especially for those who don’t live in super cold climates. 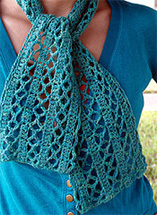 Sugar Sparkles Shawlette is another favorite– I was thinking of Thanksgiving pie crusts when I designed it. 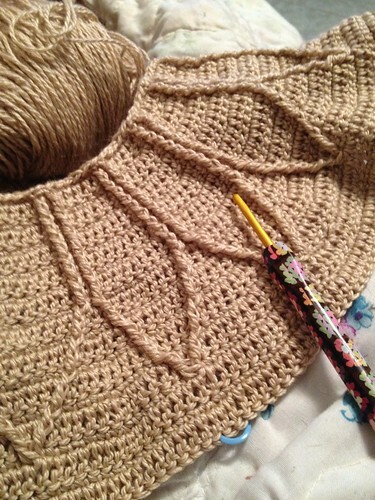 The main body is worked from side to side in lovely sock yarn, then the beaded border begins. A total of 675 beads are used in the textured lace border, which give the shawl a nice weight for wrapping as well as a subtle glisten. I’ve designed it in such a way that you can thread the precise amount of beads you need for each row as you go, resulting in a few yarn breaks but a lot less sliding of beads when you are working non-beaded rows. It also worked out perfectly that the beads show where to work the set-up row of post stitches, which was a happy discovery for me. 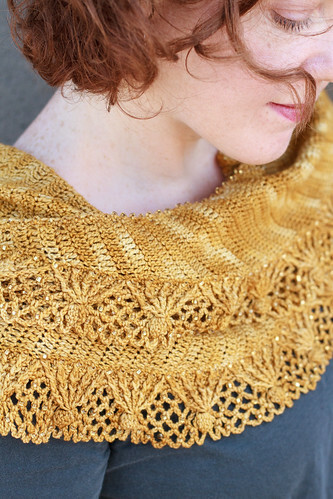 I love to wrap this crescent shaped shawl around and around so I can show off the delicate border. 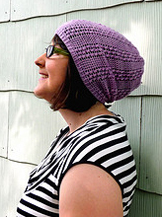 Cherry Cobbler Beanie is the second hat in the collection, and it’s sized for the whole family (14″, 16″, 18″ and 20″–and they stretch to fit heads about 2″ bigger than that). This one is also worked in sock yarn, from the bottom up, and all of the cables are worked with the right sides facing you. They converge at the top to form radiating lines, and then the ribbing is worked along the bottom edge. 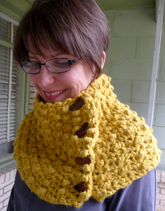 The sixth and final pattern is the Cocoa Wafer Cowl, a textured rectangle with three buttons to add texture and interest. This one has a simple four row repeat and can be pretty mindless once you get going. 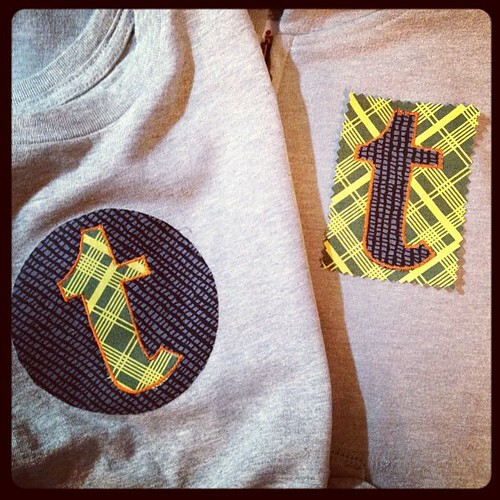 I actually want to try it using 2 colors to see what that does to the pattern–I’ll be sure to share if and when I do. 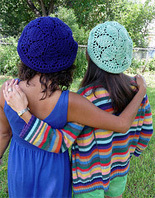 The collection is available on Ravelry or Craftsy for $18. 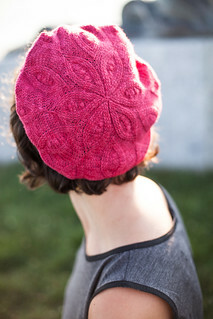 If you aren’t a member of either, you can also buy it now through this ravelry link. Happy Hooking!